Bollywood by way of Tajikistan as Tajik Jimmy sings "Jimmy Adja" from Disco Dancer during a coffee break! Today, 9-9-09, marks the worldwide release of the newly remastered Beatles catalog. The Beales changed the world and Bollywood was no exception. What follows are songs that were heavily influenced by the Beatles' music. Special thanks to itwofs.com for compiling the list of songs. First up, Shankar-Jaikishan's "Dil Use Do Jo Jaan De De" from Andaz (1971) which was inspired by "With A Little Help From My Friends" from 1967's "Sgt. Pepper's Lonely Heart's Club Band." Anu Malik's "Paagalpan Chaa Gayaa" from Jaanam (1992) is strikingly similar to "And I Love Her" from "A Hard Days Night" released in 1964. Shankar-Jaikishan's "Dekho, Ab To" from Jaanwar (1964) draws heavy "inspiration" from "I Want To Hold Your Hand" released in 1964. "Jaane Bhi De Sanam Mujhe" from Around The World (1967) is another Shankar-Jaikishan song. This time they borrow some of the melody from the Beatles' "I'll Get You" from 1964. Of course the Beatles, in particular George Harrison, were influenced by Indian classical music. In 1967, George studied the sitar with maestro Ravi Shankar. Some would say George's "Within You, Without You" from Sgt. Pepper's Lonely Hearts Club Band has elements of Naushad's "Ek Shahinshah Ne Banavake" from Leader (1963). 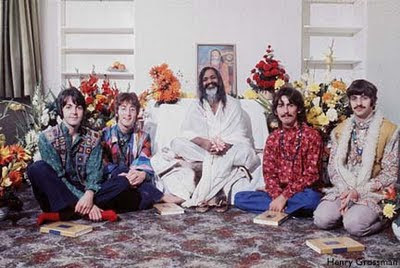 In 1968, The Beatles went to India and studied transendental meditation with Maharishi Mahesh Yogi. They also wrote some of their greatest songs while there. Many of which appeared on the "White Album." The Beatles occasionally used Indian instrumentation on their songs. "Norwegian Wood," "The Inner Light," and "Love You To" prominently feature the sitar, tabla and other musical instruments.